Delicious meat-based powder dogs love! 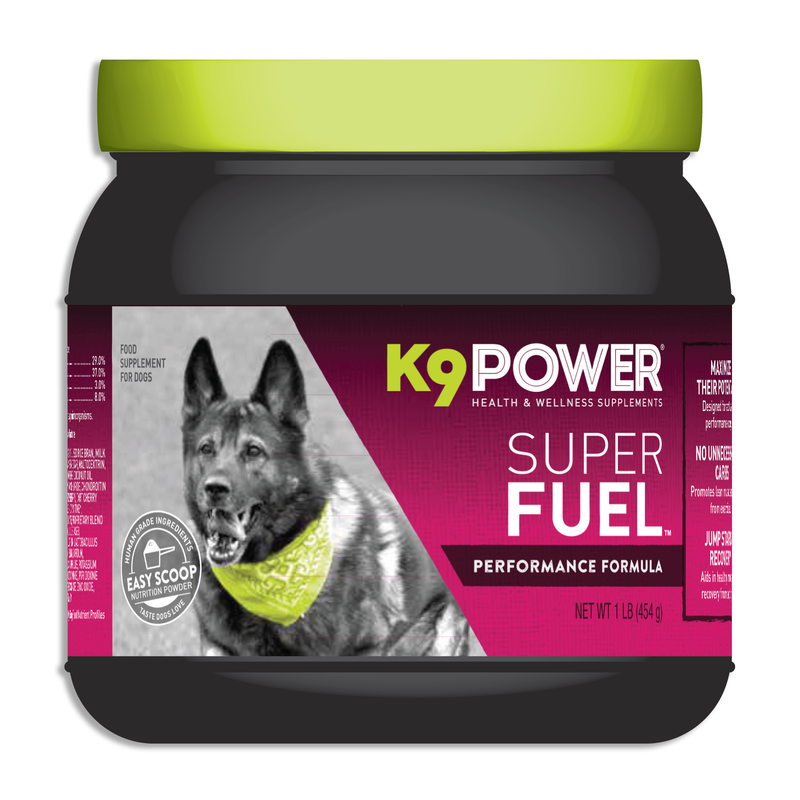 K9 SuperFuel helps support the nutritional needs of high performance dogs Designed for athletic work dogs, K9 SuperFuel can help improve the life of any active dog! Energy Fuels Readily available fuels hlep combat fatigue. Total Body Support Features nutrients that support many body systems. Ingredients: Chicken, Powdered Chicken fat, Stabilized Rice bran, Milk protein isolate, Rice concentrate, Agave nectar, Maltodextrin, Camelina oil, Citrus meal, Safflower oil, Whole egg, Coconut oil, Methylsulfonylmethane (MSM)*, Salt, Potassium chloride, Chondroitin sulfate*, Cruciferous vegetable mix, Dried blueberry, Tart cherry powder, Cranberry fruit powder, L-Leucine*, L-Carnitine*, L-Arginine*, Taurine, L-Glutamine*, Sodium Citrate, Proprietary blend of dried: (4b1891) Lactobacillus acidophilus NBIMCC 8242, (1k20735) Lactobacillus casei ATTC PTA 6135, (4b1890) Lactobacillus salivarius DSM 16351, (1k21008) Lactobacillus plantarum NCIMB 30238, (4d2) Lactobacillus rhamnosus CNCM-I-3698, 1k20715 Lactobacillus brevis DSM 21982, 4b1890 Bifidobacterium DSM 16284, 4b1891 Streptococcus thermophilus NBIMCC 8253, Potassium iodide, Choline bitartrate, Alpha tocopherol (Vitamin E), Pyridoxine HCL, Inositol, Di-Calcium phosphate, Copper gluconate, Zinc oxide, Folic acid, Thiamin monohydrate, Hyaluronic acid*. With Meals: Feed recommended dosage at meal time(s). Goes great when mix with 1-2 cups of water. Give your dog an edge in energy and endurance. 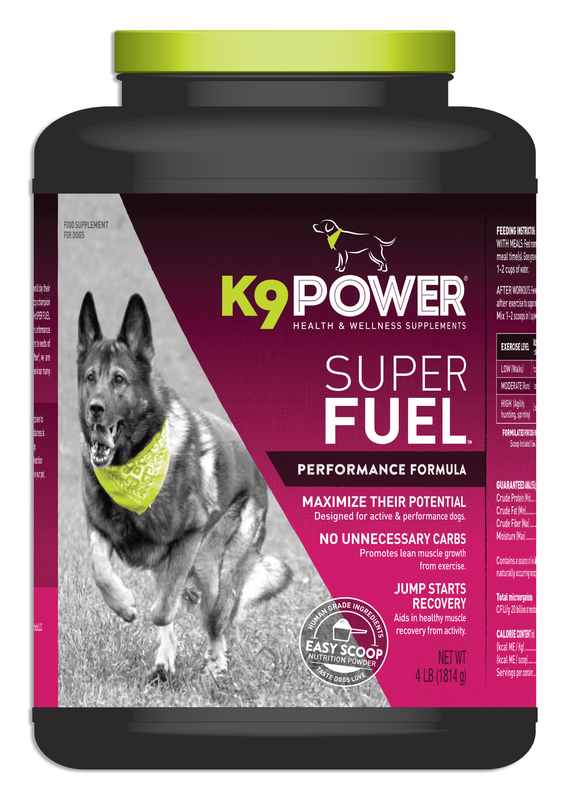 When your dog has high energy requirements to perform their best, our K9 Power Go Dog TM formula can give them the support they need. Designed to maintain healthy endurance levels without increasing stress, our Go Dog TM Hydration Mix provides your dog with the necessary nutrients for their active lifestyle. At K9 Power®, we are committed to your dog’s everyday health and wellness, and our Go Dog TM formula is one of our many products that put the needs of your pet first. Ingredients: Maltodextrin, Chicken, Coconut oil, Chicken fat, Agave nectar, Rice Concentrate, Calcium lactate, Magnesium citrate, Protein Free Beef Tallow, Salt, Potassium chloride, L-Threonine*, Creatine*, Acetyl L-Carnitine*, L-Lysine HCL*, L-Glutamine*, L-Leucine*, Taurine, Alpha Lipoic Acid*, L-Tryptophan*, Quercetin*, L-Alanine*, Glycerol, Sodium citrate, Potassium Citrate. Feeding Instructions: Pour recommended number of scoops into a standard 620ml water bottle fill with clean water and shake well. Feed small amounts of Go Dog before and during any exercise or activity. Continue to use for 30 minutes after as required. Repeat above as necessary to meet dog’s needs.